MRI alterations in the cerebral white (WM) and gray matter (GM) are common in HIV infection, even during successful combination antiretroviral therapy (CART), and their pathophysiology and clinical significance are unclear. We evaluated the association of these alterations with recovery of CD4+ T cells. Seventy-five HIV-infected (HIV+) volunteers in the CNS HIV Anti-Retroviral Therapy Effects Research study underwent brain MRI at two visits. Multi-channel morphometry yielded volumes of total cerebral WM, abnormal WM, cortical and subcortical GM, and ventricular and sulcal CSF. Multivariable linear regressions were used to predict volumetric changes with change in current CD4 and detectable HIV RNA. On average, the cohort (79 % initially on CART) demonstrated loss of total cerebral WM alongside increases in abnormal WM and ventricular volumes. A greater extent of CD4 recovery was associated with increases in abnormal WM and subcortical GM volumes. 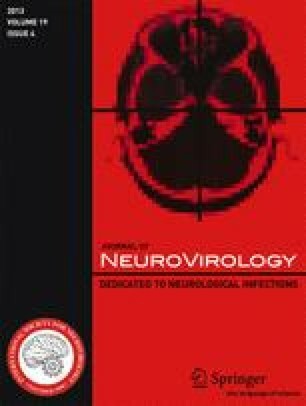 Virologic suppression was associated with increased subcortical GM volume, independent of CD4 recovery. These findings suggest a possible link between brain alterations and immune recovery, distinct from the influence of virologic suppression. The association of increasing abnormal WM and subcortical GM volumes with CD4+ T cell recovery suggests that neuroinflammation may be one mechanism in CNS pathogenesis. This work was supported by awards from the National Institutes of Health for the CNS HIV Anti-Retroviral Therapy Effects Research (CHARTER) [N01 MH2205 and HHSN271201000027C] and NIH grants R01 MH079752, NIH P30 MH0625, and R21 NS069355. The views expressed in this article are those of the authors and do not reflect the official policy or position of the United States Government. The authors report no conflict of interest. Preliminary aspects of this work were presented at the Society for Neuroscience 2010 Meeting, November 2010, San Diego, CA [Program No. 764.4], and at the Fourth International Meeting on HIV Infection and the Central Nervous System: Treating the Brain in the HAART Era, July 2011, Frascati (Rome), Italy [Poster P2]. The CNS HIV Anti-Retroviral Therapy Effects Research (CHARTER) group is affiliated with the Johns Hopkins University, Mount Sinai School of Medicine, University of California, San Diego; University of Texas, Galveston; University of Washington, Seattle; Washington University, St. Louis; and is headquartered at the University of California, San Diego, and includes: Director: Igor Grant, M.D. ; Co-Directors: J. Allen McCutchan, M.D., Ronald J. Ellis, M.D., Ph.D., Thomas D. Marcotte, Ph.D.; Center Manager: Donald Franklin, Jr.; Neuromedical Component: Ronald J. Ellis, M.D., Ph.D. (P.I. ), J. Allen McCutchan, M.D., Terry Alexander, R.N. ; Laboratory, Pharmacology and Immunology Component: Scott Letendre, M.D. (P.I. ), Edmund Capparelli, Pharm.D. ; Neurobehavioral Component: Robert K. Heaton, Ph.D. (P.I. ), J. Hampton Atkinson, M.D., Steven Paul Woods, Psy.D., Matthew Dawson; Virology Component: David Smith, M.D. (P.I. ); Imaging Component: Christine Fennema-Notestine, Ph.D. (P.I. ), Terry L. Jernigan, Ph.D., Michael J. Taylor, Ph.D., Rebecca J. Theilmann, Ph.D., John Hesselink, M.D. ; Data Management Unit: Anthony C. Gamst, Ph.D. (P.I. ), Clint Cushman; Statistics Unit: Ian Abramson, Ph.D. (P.I. ), Florin Vaida, Ph.D.; Protocol Coordinating Component: Thomas D. Marcotte, Ph.D. (P.I. ); Johns Hopkins University Site: Justin McArthur (P.I. ), Mary Smith; Mount Sinai School of Medicine Site: Susan Morgello, M.D. (Co-P.I.) and David Simpson, M.D. (Co-P.I. ), Letty Mintz, N.P., Cheuk Tang, Ph.D., and Thomas Naidich, M.D. ; University of California, San Diego Site: J. Allen McCutchan, M.D. (P.I. ), Will Toperoff, N.P. ; University of Washington, Seattle Site: Ann Collier, M.D. (Co-P.I.) and Christina Marra, M.D. (Co-P.I. ), Kenneth Maravilla, MD, KC Stegbauer, Ph.D., Trudy Jones, M.N., A.R.N.P. ; University of Texas, Galveston Site: Benjamin Gelman, M.D., Ph.D. (P.I. ), Eleanor Head, R.N., B.S.N., Gregory Chaljub, M.D. ; and Washington University, St. Louis Site: David Clifford, M.D. (P.I. ), Muhammad Al-Lozi, M.D., Mengesha Teshome, M.D.